In 1958, Charles David Keeling began measuring the concentration of carbon dioxide in the earth's atmosphere at the Mauna Loa Observatory in Hawaii. His project kicked off a half century of research that has expanded our knowledge of climate change. Despite more than fifty years of research, however, our global society has yet to find real solutions to the problem of global warming. Why?In Behind the Curve, Joshua Howe attempts to answer this question. He explores the history of global warming from its roots as a scientific curiosity to its place at the center of international environmental politics. 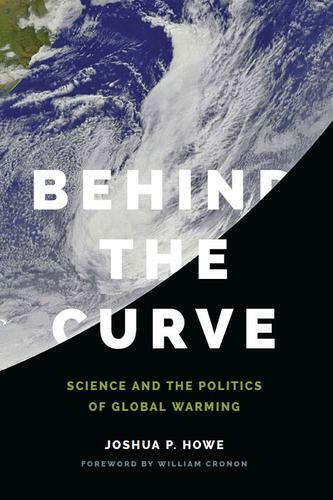 The book follows the story of rising CO2�illustrated by the now famous Keeling Curve�through a number of historical contexts, highlighting the relationships among scientists, environmentalists, and politicians as those relationships changed over time.The nature of the problem itself, Howe explains, has privileged scientists as the primary spokespeople for the global climate. But while the �science first� forms of advocacy they developed to fight global warming produced more and better science, the primacy of science in global warming politics has failed to produce meaningful results. In fact, an often exclusive focus on science has left advocates for change vulnerable to political opposition and has limited much of the discussion to debates about the science itself.As a result, while we know much more about global warming than we did fifty years ago, CO2 continues to rise. In 1958, Keeling first measured CO2 at around 315 parts per million; by 2013, global CO2 had soared to 400 ppm. The problem is not getting better - it's getting worse. Behind the Curve offers a critical and levelheaded look at how we got here.